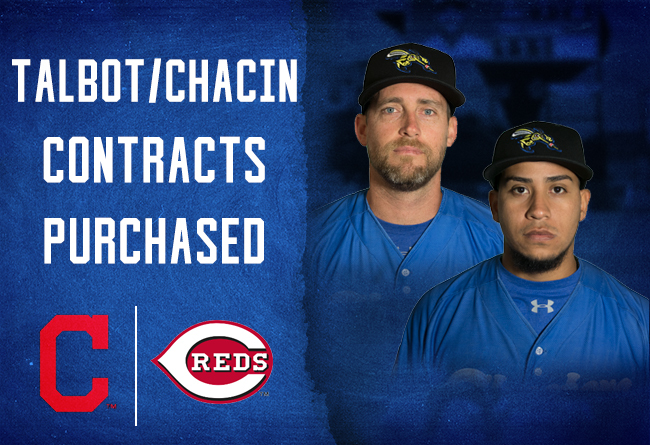 SUGAR LAND, TX— The Skeeters announced today that the contracts of right-handers Alejandro Chacin and Mitch Talbot have been purchased by Major League organizations. Chacin has been assigned to Double-A Pensacola for the Cincinnati Reds, while Talbot will report to Triple-A Columbus for the Cleveland Indians organization. Chacin, 24, appeared in 10 games for the Skeeters this season, going 0-0 with a 1.63 ERA while recording seven strikeouts to two walks in 11 innings of work. He entered Wednesday tied for eighth in the Atlantic League with his 10 appearances. The Maracay, Venezuela native made his Major League debut with the Reds in 2017 and has spent all eight of his affiliated seasons to date in the Reds organization. He recorded a 10.50 ERA through six relief appearances with the Reds in 2017, spanning six innings of work. He’s 25-18 with a 2.46 ERA in 291 career Minor League appearances – all coming in relief. Chacin was originally signed by the Reds as an amateur free agent in February 2010 out of Venezuela. He was selected as an MiLB.com Organizational All-Star in 2014 and ’16 and was selected as a Southern League Mid-Season and Post-Season All-Star in 2016 while playing for Double-A Pensacola. He recorded 30 saves in his career with Single-A Dayton, spending time on the team in three separate seasons (2014-16), and is second on the franchise’s all-time saves list. Talbot last appeared at the affiliated level in 2013 with Triple-A Las Vegas (New York Mets) and last appeared in the Majors in 2011 with the Indians. He made his Major League debut with the Tampa Bay Rays in 2008 and appeared with the Indians in 2010 and ’11. In 43 career appearances (41 starts) at the Major League level, Talbot is 12-19 with a 5.30 ERA. He was second on the 2010 Indians with 10 wins and third on the team with 159 1/3 innings pitched. The Cedar City, Utah native was selected by the Houston Astros in the second round of the 2002 MLB Draft out of Canyon View High School (Cedar City, Utah). He’s appeared at the Minor League level with the New York Mets and Miami Marlins, along with the Astros, Rays and Indians. In 184 career Minor League appearances (176 starts), Talbot is 68-57 with a 3.80 ERA through 969 innings of work. Following Chacin, Mitch Talbot becomes the fifth player from the Skeeters’ 2018 roster to have his contract purchased by a Major League organization, joining right-hander Logan Bawcom (Los Angeles Dodgers), right-hander Alejandro Chacin (Cincinnati Reds), infielder Rey Navarro (New York Yankees) and left-hander Paco Rodriguez (Minnesota Twins). Individual tickets are available now at SugarLandSkeeters.com, our mobile app, and at the TDECU Ticket Office at Constellation Field. For more information, call 281-240-4487. The Skeeters return to Constellation Field on Tuesday May 29 to begin a six-game homestand against the Long Island Ducks and York Revolution. Stop by the ballpark on Friday, June 1, for Friday Fireworks and our Comic Book Giveaway courtesy of Bedrock City Comics for the first 2,000 fans as part of our Super Hero Night. That Saturday will feature the Skeeters Bank Giveaway courtesy of Membersource for the first 2,000 fans in the ballpark and come by Sunday for Brewfest and our Beer Glass Giveaway, courtesy of Silver Eagle. Also make sure to enjoy our weekly promotions, including $1 hot dog and $2 margaritas on Mondays, Two for Tuesday, Kids in Free Wednesday and Thirsty Thursday.